Ian Burns ‘would have snapped your hand off’ for a quarter-final appearance at the ManBetX Welsh Open but was annoyed to lose 5-3 to Noppon Saengkham. The Preston potter hit the headlines in Cardiff with comeback wins over former World Champion Neil Robertson and Liam Highfield last week. But the world No.100 could not overhaul a 3-1 interval deficit and fell to defeat at the Motorpoint Arena. “It was a good week – I can’t complain,” said Burns, who reached a first ranking quarter-final at the Paul Hunter Classic, earlier this season. “If you would have said I’d have got to the quarters, I would have snapped your hand off with the way my results have been this year. “I’ve not really had a great year apart from the quarter-final in Germany, it’s been quite a poor season for me. Saengkham took a 1-0 lead in nervy opening stages that saw both players struggle. The 32-year-old triumphed in a close second frame to level terms. But the Thai cueman soon hit back with a then-high break of 41 and then reeled off a run of 81 to take a 3-1 interval lead. Burns again struggled to settle on the resumption and a break of 68 left him a single frame from defeat. Backed into a corner, the former World Snooker rookie of the year ensured the contest stayed alive with a superb century clearance of 131 without reply. A thumping long red led to a break of 25, Burns pulling another back at 4-3 as Saengkham was unable to capitalise on a couple of mistakes. Burns had dealt in comebacks throughout the week, battling back from 3-2 down to defeat Liam Highfield and former world champion Neil Robertson. But coming to the table 65 behind in the eighth, Burns could not bridge that gap and fell to defeat. “I started too slowly, to be honest,” said Burns, who fell just short of his highest career break of 136, made at the 2012 Antwerp Open. “I had chances early on but just didn’t take them and didn’t get comfortable. Burns, who turned professional in 2012, has n0t won a game at any tournament this season apart from his two quarter-final appearances. 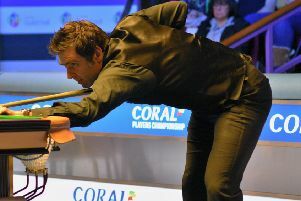 He says a lack of experience in high-stakes games could have counted against him, as he prepares for the Gibraltar Open and World Championship qualifiers. “I’ve never been particularly far in tournaments, so I don’t know if that preyed on my mind,” he said.